Enjoy the Sweet life on a brand new Sweetwater 2286 pontoon boat. This three gate pontoon boat offers the very latest in pontoon construction. From the molded plastic seat bases that will last forever to the safety of the chambered pontoons, Godfrey pontoon boats offer high quality at a reasonable price. This 2286 has Pewter rail skin and gold seat highlights. This is a very sharp looking boat. The seats are made from the new GX48 vinyl, extra soft and durable. 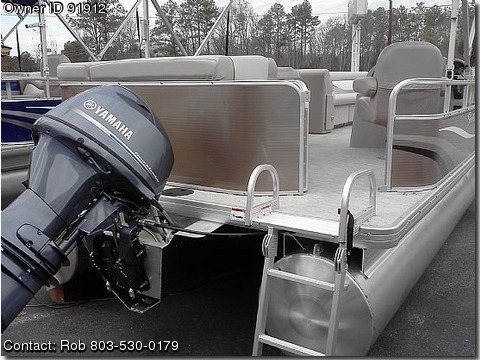 Other options are stereo with mp3 jack, playpen cover, bimini top, removable cup holder and is powered with a 70hp Yamaha outboard. This is an excellent quality boat with plenty of power for skiing, tubing or wakeboarding for well under $20,000. Check out our web site to learn more about the Godfrey pontoon products. www.nauticlean.com Give me a call today with any questions. 803-530-0179.